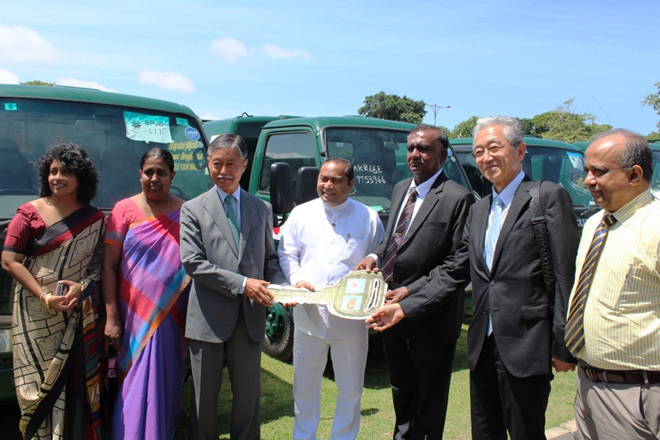 Kenichi Suganuma, Ambassador of Japan handed over 12 Waste Collection Trucks to V.K.A. Anura, Municipal Commissioner, Colombo Muncipal Council (CMC) in the presence of Isura Devapriya, Chief Minister of Western Province at an official handing over ceremony held at the Colombo Municipal Council premises. “The Project for Upgrading Waste Collection Trucks in Colombo” under Grant Assistance for Grassroots Human Security Project (GGP), was implemented by the Solid Waste Management Division of Colombo Muncipal Council. The project enabled the procurement of 12 used waste collection trucks from Japan and conduct of a maintenance training programme for the relevant officials of the CMC on the proper usage of these vehicles which will contribute to enhance the cleanliness and hygienic environment of the city of Colombo and suburbs through an upgraded waste management service. These trucks were initially donated by several local authorities in Japan viz., 3 from Osaka city, 2 from Chiba city, 2 from Sapporo city, 2 from Okayama city, 1 from Sagamihara city, 1 from Kakamigahara Seiso Co. Ltd., 1 from Mizumaki Bika Center and facilitated through the courtesy of the Society for Promotion of Japanese Diplomacy (SPJD), an organization in Japan which carries out a particular scheme to coordinate the donation of used vehicles such as waste collection trucks to foreign countries. Moreover, the week-long training of relevant officials from the CMC on the operation and maintenance of these trucks was conducted by Japanese Engineers from Kyokuto Kaihatsu Kogyo Co., Ltd.. The aim of the training was to provide sufficient knowledge on the equipment and the multiple functions for the safe operation of the vehicles and their proper maintenance on a daily basis as well as periodical servicing.